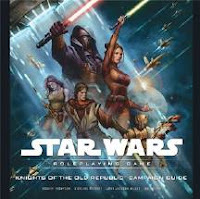 News from the Game Manufacturers Association (GAMA) Trade Show: the Star Wars: Knights of the Old Republic Campaign Guide has been nominated for an Origins Award. The guide, written by Rodney Thompson, Abel Peña, Sterling Hershey, and myself was nominated for "best role-playing supplement." The Saga Edition rules were also nominated for best system. Attendees at the Origins convention will get a chance to vote for the finalists. This is my third Origins nomination, following the Scrye Collectible Card Game Checklist & Price Guide in 2001 and Comics & Games Retailer (1998, I believe). All were labors of love, and it's gratifying to be considered — especially as the nominations came from the retailers who specialize in these products on a daily basis. No, not the roller coaster, nor the old pinball machine from Williams — but the July issue of Knights of the Old Republic, which now has a page on the site here. Knights #43 has a spiffy cover by Benjamin Carré. Order yours now! Well, I sure as heck didn't mean for it to be close to a month between posts here — but I'm working on several projects simultaneously, and it's kept me busy enough that I haven't had time to discuss those that I can talk about. And none at all to delve into the other bloggy things that bloggers do. So hang in there — and make sure to grab Star Wars: Knights of the Old Republic #40 when it graces your stands later this week. Updates on that and other things will come as I have them, hopefully more often than of late...!